Childbirth is always very thrilling, especially if it’s a long-awaited baby boy, who came into the world to bring joy and happiness to everyone around him. 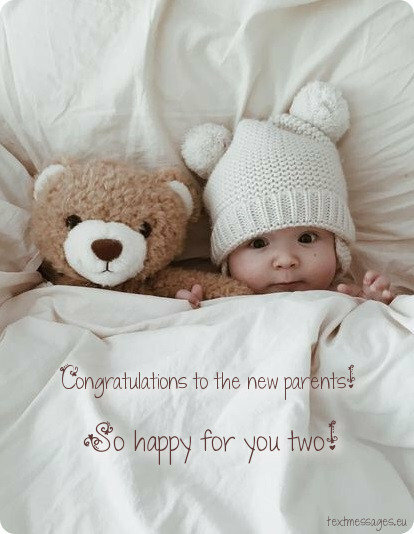 Happy new parents would definitely like to receive some nice words from their friends and family congratulating them on the birth of their wonderful son, as well as the words of support, because raising a boy won’t be easy. Mum and dad need to know that they are not alone. On this page you’ll find a lovely collection of newborn baby boy wishes for parents with images that will help you to express your joy and support. Baby is the greatest gift, the greatest happiness. And it requires a lot of attention, love and care to grow up and manage to stay pure and bright. 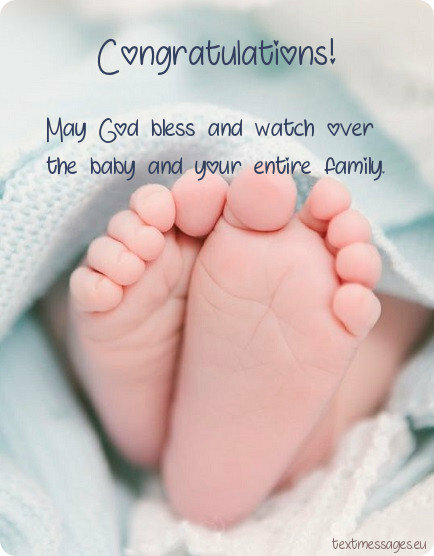 Best wishes to the new parents and their adorable baby! Turn the page and start a new chapter – the chapter where one new character appears, the main character of the story. I wish that your book be the most magical and marvellous in the world and its main character would become a real hero. Congratulations on the baby! From now on, your house will be filled with laugher and happiness. Sometimes it will be filled with crying and noise, but still positive emotions will prevail. Enjoy being parents and be proud that you have an opportunity to raise a kid! What a beautiful day! The best day for such a wonderful event! I congratulate you on the birth of your son and wish that every day of his life be just as amazing as the day when he was born. Your wonderful family has extended recently and that’s why I want to wish you much patience, wisdom and kindness. And also I want to wish your baby to grow up healthy, honest and happy! It’s not just a childbirth – it is the birth of a Man. I really believe that your baby will become a man with the capital M and bring much happiness and joy to his parents when he grows up! Dear new dad and mum, I want to congratulate you on the birth of new member of your family and the whole society. I really wish that this beautiful baby become an honourable man and make his parents proud. The birth of a son is a real blessing for his mother and the best reason for self-congratulation for his father. May this nice baby be the light of your life that will lead you to a pure happiness and harmony! Some people think that a man should be the head of the family, others prefer matriarch. But the truth is that the main member of the family has been born recently. It should be the reason and aim of everything you do forever and ever. Congratulations! Finally, you had a baby boy! I’m so happy for you. Cherish the moments you have with him, because kids… well they grow up really fast, you won’t even see where the time flies, and you will miss every second he is not with you. Raising a child is never easy. It’ll take a long time before your baby turn into a real man. But I’m sure you’re the best parents ever and bringing up a kid will be a pleasure for you. Congratulations! 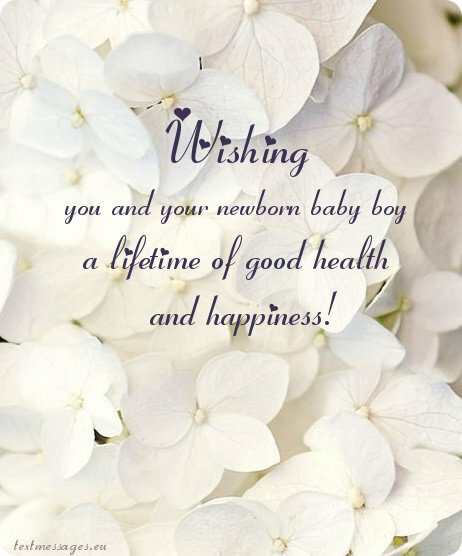 I congratulate you on the birth of a child and wish your beautiful family a lot of patience, warmth, well-being and happiness. May your baby bring only joy to his parents! Childbirth is the most important and the happiest event in every person’s life. But still there are even more important things: health, happiness and well-being of your baby. Congratulations and best wishes to you! A baby is a real wonder. Maybe, it won’t bring you peace and rest in the coming years, but it will definitely bring you much happiness. Congratulations on the new baby! A baby is a hard test, but at the same time it’s a real blessing. Raising a baby will open a completely different world to you; it will show you the true meaning of life and help you to know yourself. Congratulations! 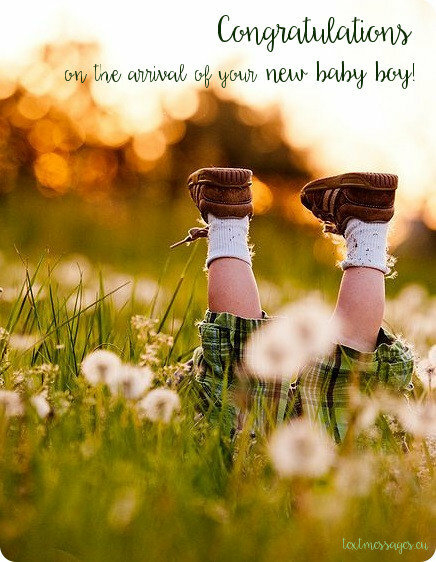 May your baby grow healthy and active, may he be talented and clever, may he make his mum and dad proud and happy! Congratulations on the baby! The birth of a baby means a lot more as it might seem at first. It’s the living embodiment of life, of love and of the future. A baby is everything and parents’ task is to develop the best parts of his soul. Congratulations! Having a child is a pure happiness. But having a healthy, smart and friendly child is the biggest happiness on Earth, that’s why I wish your baby to have all the mentioned above qualities. Congratulations! Raising a baby is about having ups and downs, inspiration and disappointment, confidence and doubts. It won’t be easy and you’ll have to put a lot of time and a huge piece of heart into your child. But it’s really worth it. Congratulations! A small baby is able to make such a noise and gets into troubles constantly, but he also brings a huge joy and pleasure to its parents. Enjoy raising your kid and give him as much love as it’s possible. Congratulations! The delivery was not the hardest thing at all. The older your child gets the bigger difficulties you have. But love and care will defeat all the obstacles. Congratulations on the baby! You can’t even imagine how this little tiny thing will change your life. And be sure that despite all the negative feelings you may experience during this difficult period, this change is for the better. Congratulations! Childbirth is the birth, the beginning of sleepless nights and unrest, of troubles and difficulties. But it is also the birth of true happiness that will help you to overcome all these obstacles. Congratulations on new baby! Prepare to be teachers: wise, experienced, sometimes kind and funny, sometimes serious and strict. Prepare to be students: sometimes excited, sometimes bored. A little baby requires a lot of attention, time and care, but it’s also able to show you things you thought you’d never know. Congratulations on the childbirth!